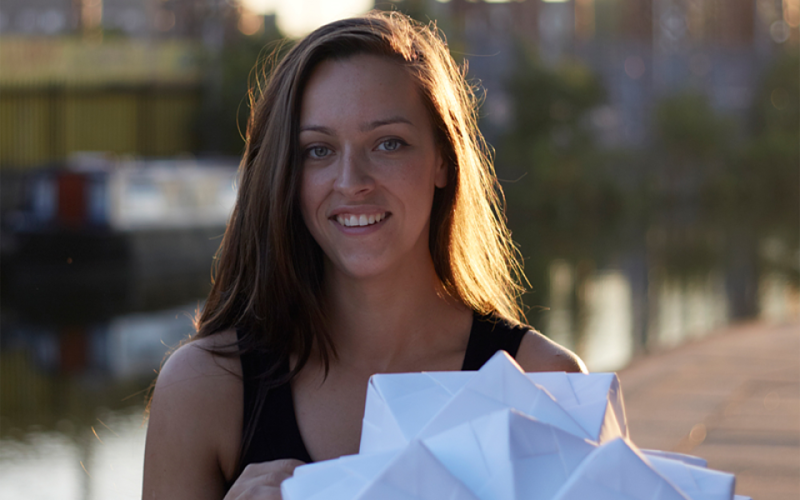 Kyla McCallum’s design studio, Foldability, specialises in products and spaces inspired by folding and geometry. Inspired by her studies and motivated by the business opportunities that London has to offer, she embarked on starting her business and facing the highs and lows with support. We spoke to Kyla about where her start-up journey has taken her. Tell us more about your business idea? At University I had the chance to study across a broad range of disciplines including branding and graphic design, product design, exhibition design, fashion, service/system design, user research and sociology. When I graduated, I wanted to find a way to bring my design skills to a range of different industries, rather than being a specialist in one particular field. I’d always been quite obsessed with origami and geometry so Foldability seemed the perfect vehicle to apply my 2D/3D skills across a number of applications. What support did you receive from the London Small Business Centre? I found London Small Business Centre by doing a search online for support for creative businesses in London and my experience has been brilliant. My advisor is Paul Creavin, who has helped me through many highs and lows on the journey of setting up my business. He is incredibly professional and I really quickly got a sense that he is 100% committed to the businesses he works with. Paul has boosted my confidence when I’ve been feeling low, helped me with important decision making and working through day-to-day issues that I’ve faced within my business. Another great experience with the centre was being invited to meet and present my business to two Directors from Ted Baker. One of them has since been mentoring me for over a year now and I wouldn’t be getting his advice if I hadn’t been introduced to him through the London Small Business Centre. I found it very difficult to identify what my business model would be and I am still trying to work this out! I’ve test traded in a few different ways which really helped me learn about different models of working and define which would be most suited for my business. I also spoke to others about their model which has helped shape my own. Another challenge has been to be honest with myself about what my motivations are. Often opportunities would crop up that I wasn’t expecting and I would find myself spending time on things that weren’t part of my plan. I’ve been learning to be more honest about what I do and don’t want my business to be and I’ve found that the more I put that out there, the more my business begins to take a shape that I’m happy with. Recently, I had the opportunity to create a set design piece for the L’Oréal Colour Trophy Awards in collaboration with Sebastian Acker. We designed a large folded backdrop for the catwalk which was made from aluminium. I love working on large-scale projects so this was a great experience and I hope to do a lot more set design for brands in the future. Do you have any tips for future entrepreneurs? I made a business plan before starting but I didn’t fully see the point of forecasting without any hard financial information or trading experience. Looking back, I wish that I had done more research into different business models and what it would be like to do each of these in a day to day sense. I would advise anyone thinking of starting a business that they should go and meet with other people running similar businesses and find out what their business model is. There are lots of businesses out there who have tons of experience and information which they are willing to share. I’ve been positively surprised at how open and willing others have been to sharing their experiences and helping me with my business. There’s so much support out there, all you have to do is be brave enough to ask. Talking with people who have already been through the journey can help you shape your business plan before diving in and potentially wasting a lot of time and money. What does the future hold for Foldability? I have a few exciting brand collaborations in the pipeline, more to come on this soon! I’ve recently been doing a lot more consultancy work where I collaborate with brands to develop projects inspired by origami and geometry. I hope to do more of this in the future as it allows me to focus on the research and design phase and gives me the chance to learn about different industries and bounce ideas off others. I’m also working on some of my own brand products with interior and fashion collections which I’m aiming to launch over the next year.